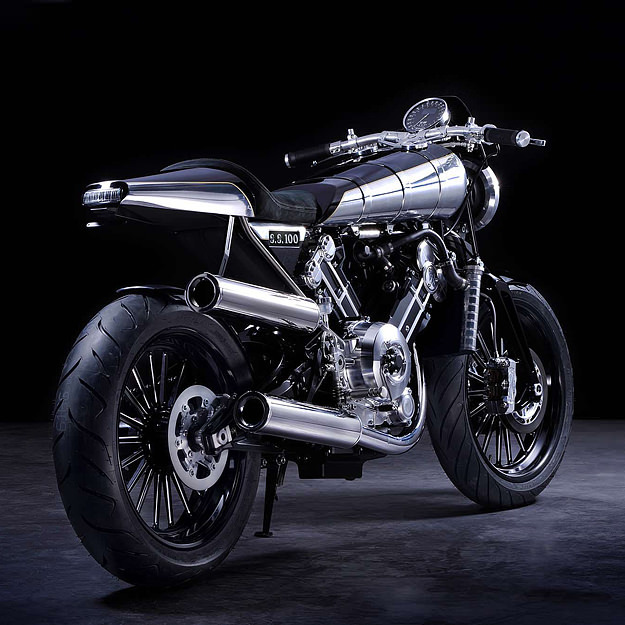 So here is the new Brough Superior — the first all-new bike from the famous marque in seven decades. 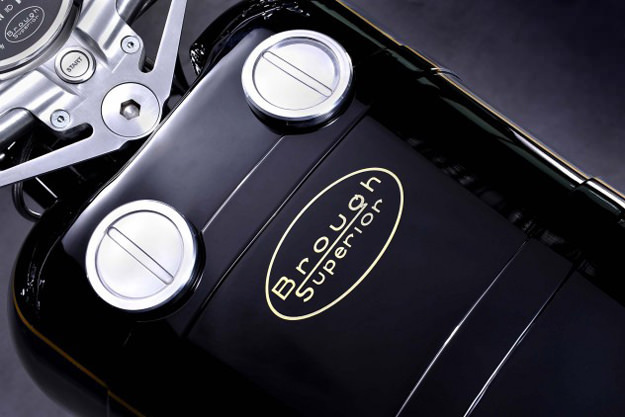 The rights to the brand name are now owned by the Austrian-based businessman Mark Upham, who’s been teasing us for the past three years with beautiful recreations of George Brough’s 1920s originals. Upham has now taken the bold step of commissioning a ‘new’ SS100, a vintage-flavored machine with a mix of new technology and retro styling. It’s due to enter small-scale production in 2014 and will retail for just over $65,000. 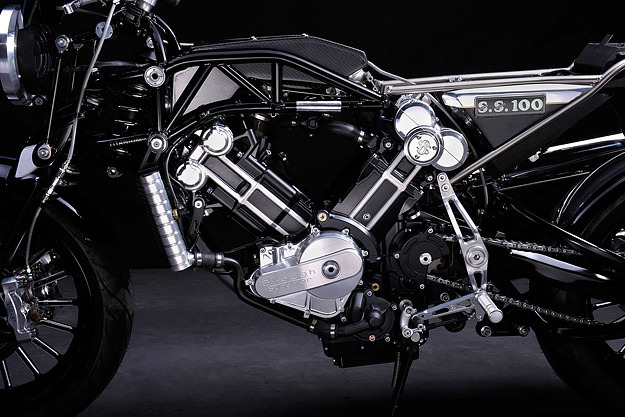 The heart of the SS100 is a 997cc powerplant—an 88-degree liquid-cooled v-twin. (Top marks to Brough for keeping the engine compact, and not getting into the silly figures favored by US cruiser manufacturers.) 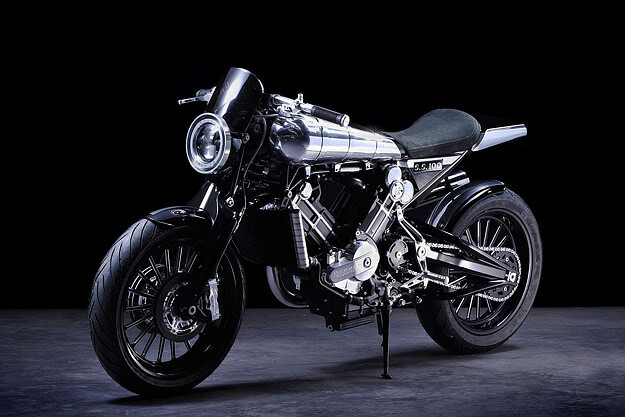 The motor is the work of the French firm Boxer Design, and it’s an eight-valve DOHC unit capable of up to 140 hp. 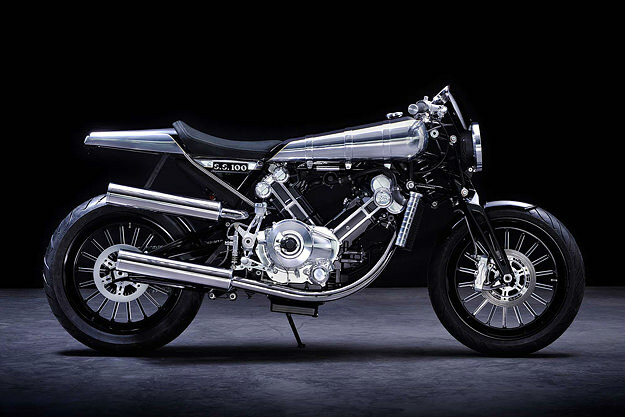 In keeping with Brough Superior’s venerable reputation for engineering, the frame is a mix of steel and titanium, and the swingarm is an aluminum-magnesium composite. 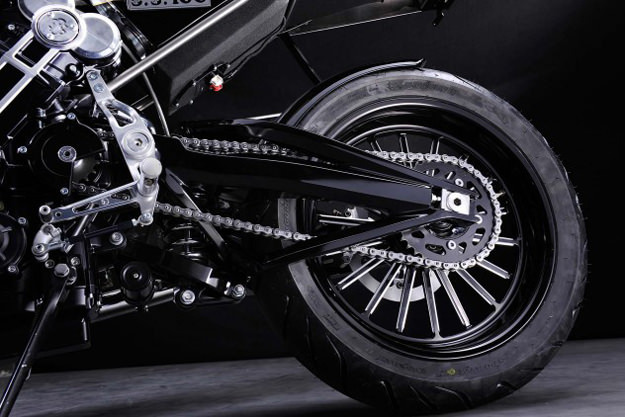 Up front is a girder-style ‘Fior’ double-wishbone fork; like the back end, it’s suspended with an Öhlins shock. The front brakes, looking strangely small for a machine of this caliber, are actually four 230 mm discs aligned to look almost like a drum brake. The system has been designed by Beringer to reduce gyroscopic forces. The wheels are 18” front and back, and we’re told that the dry weight of the SS100 is just under 400 lbs. I think George Brough would have approved of the specification. The question that remains is around the styling, an entirely subjective issue. from Bike EXIF 2013. Named themselves "The world authority on custom motorcycles.